Scott #16, 1872 1/2gr orange Imperial Eagle. Used F-VF. 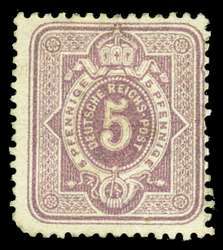 Scott #30, 1875 5pf violet Numeral. Mint Fine, no gum and minor fault. Looks nice. Scott 2005 value $92.50. 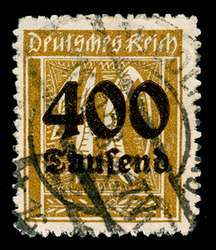 Scott #57, 1900 25pf orange and black, yellow paper Germania. Used VF. Scott #168, 1921 60pf red violet Iron Workers. Used VF. Scott #181, Strip of 4, 1921 10m carmine and pale rose Post Horn. Used VF. Scott #181, 1921 10m carmine and pale rose Post Horn. 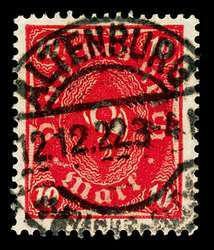 Used VF with Superb ALTENBURG 12.12.22 cancel. 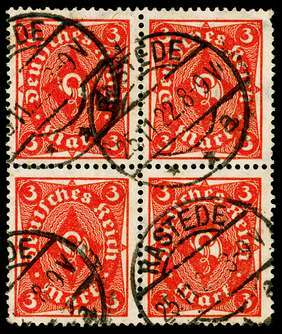 Scott #186, Block of 4, 1922 3m red Post Horn. Used VF with one pulled perf. Scott #190a, 1922 8m olive green (Type II) Post Horn. Used F-VF with VF cancel. 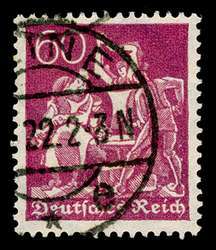 Scott #229, Block of 4, 1922 100m violet Numeral. Used VF. 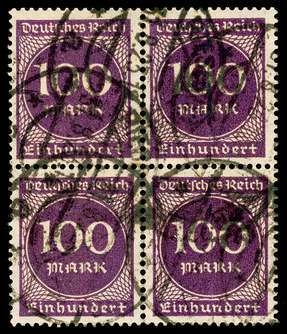 Scott #229, Strip of 5, 1922 100m violet Numeral. Used VF, one creased. Scott #276, 1923 400th m on 40pf bister Numeral Surcharged. Used VF. 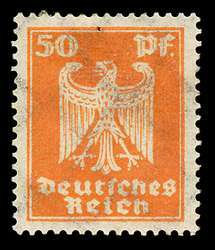 Scott #336, 1924 50pf orange German Eagle. Mint VF. Scott #375, 1928 20pf Prus green Pres. Friedrich Ebert. Used VF. 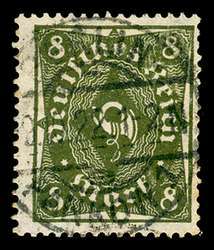 Scott #375, 1928 20pf Prussian green President Friedrich Ebert. Used VF. 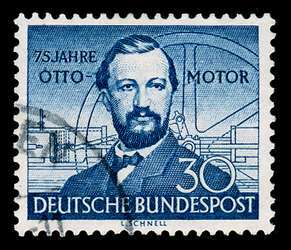 Scott #436-41, 1934 Hindenburg Memorial Issue. Used VF. 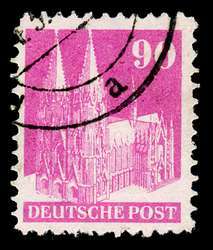 Scott #657, Perf 11.5x11.5, MI #96WIIC, 1948 90pf rose lilac Cologne Cathedral. Used VF. 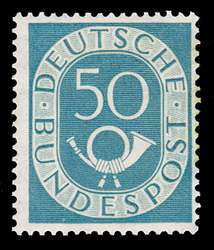 Scott #681, 1952 50pf blue gray Numeral and Post Horn. Mint F-VF LH. 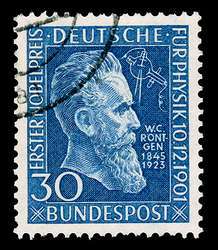 Scott #686, 1951 30pf blue W. K. Roentgen. Used Superb. Scott #688, 1952 30pf deep blue N. A. Otto. Used Superb. 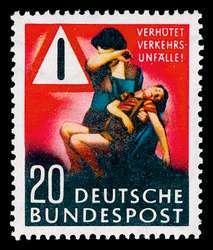 Scott #694, 1953 20pf black, red and blue green "Prevent Traffic Accidents". NH Superb. Scott #717, 1954 80pf deep rose President Theodor Heuss. Used F-VF. Scott #717, 1954 80pf deep rose President Theodor Heuss. Used VF. 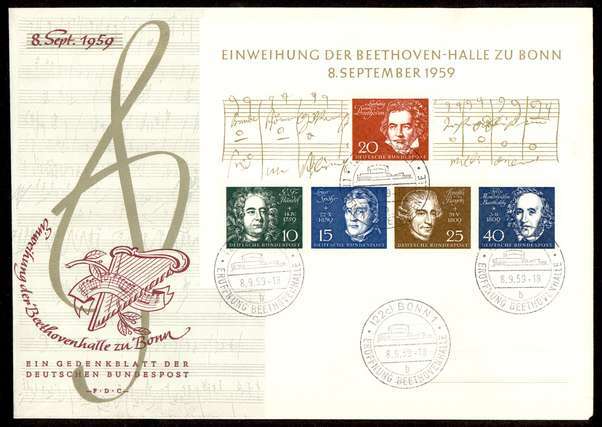 Scott #804, 1959 German Composers Souvenir Sheet First Day Cover; Handel, Spohr, Beethoven, Haydn, Mendelssohn-Bartholdy. Cacheted and unaddressed. VF. Michel value DM140 (about $170). Scott #1074-85, 1971-74 Accident Prevention. NH VF. Scott #1858, Mini-Sheet, 1995 640pf rose brown and gray blue Speyer Cathedral. NH VF. Mini-sheet of 10. 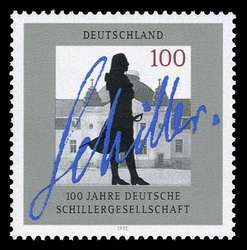 Scott #1893, 1995 100pf multicolored Schiller Society Centenary. NH VF. 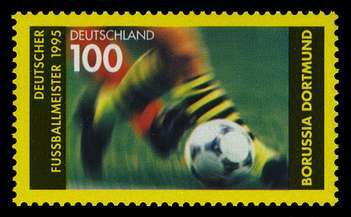 Scott #1914, 1995 100pf multicolored Soccer (Football, Fotboll). NH VF. 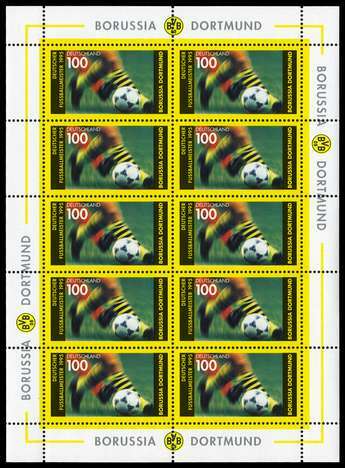 Scott #1914, Mini-Sheet, 1995 100pf multicolored Soccer (Football, Fotboll). NH VF. Mini-sheet of 10.